When it comes to getting the kids ready for the start of the new school year tomorrow, I only had one goal. That was to get rid of the Christmas tree. Anything else would be a bonus. I could send the kids to school in their pyjamas or even without any lunch. The school would sort that out…particularly when Mum is having chemo. However, no one else could save us from the dreaded Christmas Tree Curse. Only we could save ourselves! Now, I’m not superstitious or anything silly like that but when your luck has been down, turned around and is currently behaving its self, are you prepared to take a chance? That Christmas tree might have looked all sweetness and light at Christmas time all decked out with baby Jesus, Santas, stars, angels, tinsel and flashing lights but all that might well change if you don’t watch out. That innocent looking Christmas tree could well be out to get you! However, the Christmas tree curse wasn’t why I was rushing to get my Christmas tree down before school goes back. Well, considering it’s almost February, you’d be right in thinking that I haven’t been rushing to get our Christmas tree down at all. Indeed, it is now more than a month after Christmas and at the rate I’m going, perhaps I should just leave the tree up for next Christmas. I’m sure Santa and his elves along with many kids are already counting down. However, our Christmas tree won’t be hanging around. We have a real tree each year and while it’s always been technically dead, now that it’s turned brown and the needles are crunchy, its more than official. We’ve been away and as Geoff not so subtly pointed out, you can’t take your Christmas tree down if you’re not home. That’s very true but we still need to be ready for the new school year…organised! The start of the new school year is just like the start of the year itself although instead of being called “resolutions”, these good intentions are set in a bit more concrete and are actually called goals. This makes them feel much more real almost like places on a map than castles in the air. This year, I’m particularly keen to start off on something of a high note because I know it’s a rapid slippery slide down hill. Instead of falling srig and perhaps if you start further up the hill this year, you might not end up face down in the mud at the very bottom of the hill by the end of term. Knowing that I’ll be having chemo fortnightly throughout first term, I’ve actually felt more motivated to get my act together and perhaps be anally organised just to have a hope of getting my kids to and from school on time and their basic homework done. I’m not talking about becoming a Supermum or anything that radical. I’m just looking for a pass…your standard C.
That leaves me with one rather desiccated Christmas tree to get down. Those decorations need to be packed up and Christmas needs to go to bed. Good night. However, I’m not sure if I can get the Christmas tree down or should get it down. Ever since the kids were babies, we have elevated our Christmas tree and set it up on top of our combustion heater about a metre above the floor. At this point, I’ll just remind you that I have muscle weakness, poor coordination and I am currently on chemo. This is not the sort of body that’s in any fit state to go climbing Christmas trees. I need to keep my dodgy feet on terra firma. Behave myself. Look after number 1 and apparently that means me. I don’t know if you have ever read any of the Hairy McLairy Series of books but there is a delightful Christmas book where Slinky Malinky the svelte black cat climbs up the Christmas tree. Well, you can be sure that I am no Slinky Malinky. I am Mummy McClunky who goes bang and bumpy. I trip over the smallest crack in the footpath with sometimes disastrous consequences. I shouldn’t even be thinking about climbing up that Christmas tree but I want that tree gone and I want this family organised for the new school year whatever it takes. I mean whatever it takes! That means getting rid of that tree this very instant! Now, it’s time to put my thinking cap on top of my battling chemo brain. Can I find a way? Is there some way, I could get that tree down without climbing anything? I have two more than capable assistants. So as much as maybe we should wait for Geoff to get home, you always knew we were going tackle this tree and get it down and out. I must admit that it’s this cavalier type of thinking that keeps Geoff very busy sorting our Rowie-made disasters! There’s always some small detail which I manage to overlook. However, it’s usually not such a small detail after all. More like a huge gaping hole and I’ve inflicted major damage as a result. I am off to survey the damage now. Plan our attack. It’s going to be a bit like felling a tree inside our house…timber! I can see that tree falling down….falling down with our violin angel still sitting at the top and I have to make sure she comes down safely. Doesn’t break. She’s very, very precious. Need to do this carefully and think like Geoff instead of my usual impetuous self. Plan ahead, look out for the risks. Perhaps, I should’ve checked the tree out before I went all psycho and catastrophosed the whole thing. Now, that I’ve assessed the tree, the jolly thing has shrunk considerably. I don’t need to climb anything. I can just reach out and snip the string and grab the tree. Way too easy peasy for a chronic catastrophiser like myself. So once again, I have managed to inflate a surmountable problem into a huge inflatable monster. You know like one of those advertising inflatables which you see on top of car yards and the like. They’re so big that you can see them a suburb away. Well, I’ve done that again and I’ve gone through this whole drama about how I can’t do things because of my muscles disease and that I shouldn’t take the risk of climbing up the tree when I didn’t need to climb anything at all. I could handle the situation without all that need for drama and self-doubt. I could do it. What I do need to do is beat myself up with a stick because I can do it. I really can do it and I’m going to get rid of that tree right now as soon as I’ve photographed it for posterity….the biggest Christmas tree in history. Several hours later, I think we’re all ready for school. The kids made pizza again for dinner tonight and their skills are improving and I just need to stop myself from taking over. I’ve even made them some somewhat healthy biscuits for morning tea and they’re taking left over pizza for lunch. We’ve had no luck betting them to eat their sandwiches so hopefully this will work. Anyway, what I really needed tonight was what always eludes me…an early night!! This entry was posted in Humour, Parenting, Uncategorized and tagged auto-immune disease, cancer, chemotherapy, Christmas tree, chronic illness, health, kids, love, mom, mum, parenting, school, school holidays, Sydney on January 28, 2014 by Rowena. On Wednesday, I went into the Lifeline opportunity (op) shop in Avalon and had a totally life-changing experience. Even with my great faith in op shops, even I was amazed! After all, don’t you usually have to do something totally and utterly amazing to have such a profound life changing experience? This is why bucket lists are so popular and seekers almost go bankrupt climbing Mt Everest only to go scuba diving in the deepest depths of the Mariana Trench at the other the extreme. I have more justifications than a politician for why I can’t undertake such adventures and you are probably much the same. You are also bound to your own patch of soil and just can’t take off and travel the world to “find yourself”. Instead, you have to find yourself in the much less glamorous context of home among the relatively mundane and every day. Don’t despair! You don’t have to go anywhere to be profoundly inspired and experience real miracles. Miracles can and do happen anywhere at any time… even in the most common, ordinary and everyday places! They’ve even happened to me. Although they seem unlikely sources of inspiration, I’ve been amazed at what I’ve actually found in op shops. In these halfway houses where discarded, unwanted junk and otherwise faded dreams are recycled and reborn, I’ve found treasures which fit my needs exactly, like a key in a lock. It’s like someone has gone in and left it there for me personally. That it’s had “my name on it” and the price is right too. However, Geoff will tell you that the cumulative effect has been quite expensive. I’ve found a lot of truly inspiring things lately but I particularly wanted to share my visit to the Lifeline Shop in Avalon on Wednesday. This was the day before my latest session of chemo (or round one as I’ve now found out) and the day before I received my results so I was naturally in a fairly profound mood and actively searching for inspiration and retail therapy on a budget of sorts!! Hard to believe John Denver ever had “the look”! 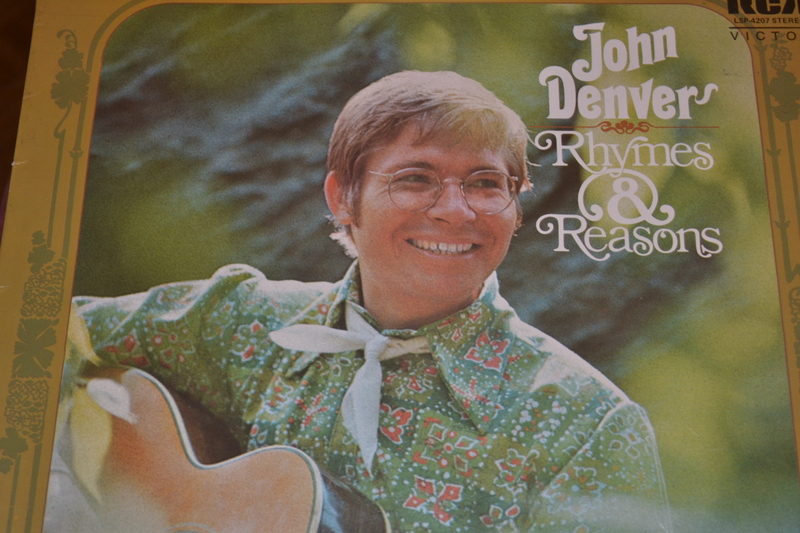 My first amazing “find” was a record by John Denver called Rhymes & Reasons. The cover is so 1960s and he looks like a real Irish leprechaun is a very green outfit. I don’t usually buy old records but I’ve never found any worth buying before. This one strangely appealed to me. I don’t know why. It just said pick me up. Have a closer look. Turn me over. By contemporary tastes, the cover was very “bad taste”, dated and even comical but there was a sincerity about it…his smile perhaps and I do love John Denver’s music. Actually, looking at the cover now, it was stamped 1969 which was the year I was born so perhaps this is even more of a message for me than for my children which is how I perceived it at the time. That’s right. I’m a real flower child. And a blessing for today. Doesn’t that just blow your mind away? I think I’m going to have to find this album on CD or convert it over or something. The songs are brilliant too and I really wish I could listen to it right now: Leaving On a Jet Plane, the Love of the Common People, I Wish I knew How it Would Feel to be Free, Today is the First Day of the Rest of My life. There is also a song I haven’t heard called Catch Another Butterfly. Don’t know what that one is about but I use butterflies as Amelia’s symbol. She is the pink butterfly on my charm bracelet and I decorated her bedroom with butterflies before she was even born. She was my beautiful butterfly baby! By the way, I also picked up a little toy tea set for her with butterflies on it for her upcoming birthday. Another “coincidence”! The record cover was my first “connection” but my finds rapidly continued. Soon, I came across the handbag which I wrote about in a previous post. Now, I have been on the hunt for the perfect, black handbag for years. You see, I am seriously organisationally and spatially challenged and I’ve really been working hard to overcome these problems, especially once I found out about neuroplasticity. The idea that I could actually change the way I think and the very structure of my brain through repetition and that I wasn’t set in stone, set me free from so many self-imposed constraints. Armed with the evidence that practice instead of avoidance was the way forward, I could now radically improve some of what I had considered insurmountable personal faults. I even have a shunt in my brain to remind me that I’m not quite “normal” so I had good reason to believe in my limitations. They’d been fully documented on MRIs. However, this new found neuroplasticity literally took the bird out of the cage and offered me back up to the sky and now I’m flying free. That’s a huge change…liberation in fact! Anyone who knows me will choke because they know how disorganised I can be. What I’ve found works for me, is having a place for everything and everything in its place. Please note that this hasn’t been achieved. I’m still struggling to find a place for the most important things and trying very, very hard to be systematic and actually put them back there again. You need a system, structure, routine. These are precisely the skills I lack in myself so I have to import them from outside myself. This is why I, in particular, needed this perfect, very well-structured and organised handbag. It’s finally going to get me “sorted”. The trouble is that when it’s come to finding this perfect bag, I’ve had many false friends. The handles haven’t been strong enough to manage my books and there hasn’t been an outside pocket for my phone. I go to reach in for my keys and a handful of tissues fall out. I have many, many bags but most of them probably need to be sent to the op shop for someone else to “discover”. Inside the bag- fabulous organisation! Anyway, when I went to the op shop on Wednesday, I wasn’t looking for handbags. I was looking for books…inspiration! However, I spotted this bag. It was black. It was leather but it also had a $25.00 price tag and I was already in serious trouble for overspending in op shops. But it was leather and it wasn’t that expensive and it wasn’t going to cost anything to check it out. Aha! I lifted up the clasp and hey presto. There it was… the perfect handbag with separate, individualised spots for pens, my business card, cards, keys, wallet and room for my book and notepad. It had a place for everything to stay in its place and it also had a strong 2cm leather strap which could go across my body so it wouldn’t fall off my shoulder all the time. Moreover, if you are into brands it was a Fossil meaning it was very stylish and retails for around $300.00…so it was quite a steal at $25.00. Yesterday, I took the bag with me for my big appointment with Professor and I felt so organised and “together” and that really helped. I had everything to hand at what was potentially going to be a very emotionally challenging time and that made such a difference. I was actually “together”! Thank you Lord! I never expected that our God who created the universe could be bothered with my quest for the perfect handbag but he was. For some strange reason, he cares about me on a very personal, intimate level that doesn’t always make sense. Things dosn’t always happen in quite the way I’d expect but he’s always in the picture somewhere. However, I wasn’t there for handbags or the John Denver record. I was mainly interested in books. The books were up the back of the shop and I sat down there for quite some time meticulously going through them. First, I built up my pile and then I was trying to be ruthless, which I always find so difficult with books. They all want to be my friends and each has a compelling story to tell. I went through my pile several times putting back quite a few titles in a futile attempt to feign self-discipline. Each of the books somehow seemed to speak to me in a profoundly personal way. Books have a knack of that. However, contrary to appearances, I’m being very selective and am trying to rein the books in. Two years ago, I actually pulled off a quest to cull 100 books from our house and that was a massive effort. I have seriously undone all that good work on these holidays with the enormous swag of books I’ve bought. I dare not do a count. Anyway, while I was hovering around the counter, I spotted a huge family King James Bible dating back to 1960. While it isn’t antique, it has a lot of Victorian flourishes including, as I subsequently found out, a section in the middle for writing up your family tree. You can’t get much more Rowie than that!! Anyway, the lady in the op shop gave me the Bible. “You can have that,” she said. She didn’t know this but I’d actually left my Bible at home so this was quite an inspired gift. Well, you could say that a Bible is the ultimate inspirational gift but that means you also have to read it and there’s the sting. Divine Inspiration. The Bible just fell open at this page. As children, this was a verse we really had drummed into us in Sunday School. We all loved it, of course, because we thought it meant we could have all the toys and lollies our little hearts desired. However, I still remember my disappointment as our teacher explained that it didn’t work this way. I’m still not really sure that I fully understand how this verse does work even now but with my medical results due in the morning, it gave me fresh hope. 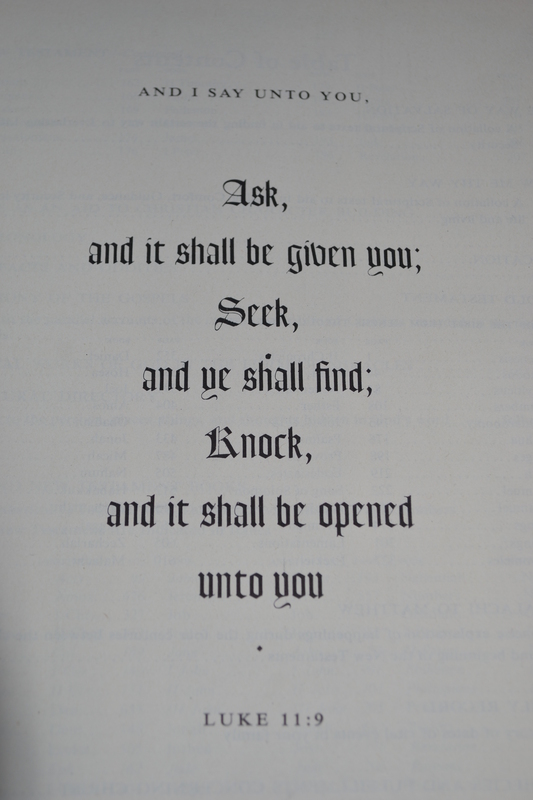 Ask and it shall be given to you and it was. My treatment has worked. Just like a common pizza, God has delivered. It was almost too simple. A very intriguing book which I hope is opening up my ears to God. I have plenty of scope for improving my listening skills in general too and applying the two ears one mouth ratio. And all that is good. I’m going to paste this into my book of life lessons I’m putting together for the kids. You have been taught to live in fear. You have been told about survival of the fittest and the victory of the strongest and the success of the cleverist. Precious little is said about the glory of the most loving. And so you strive to be the fittest, the strongest, the cleverest – in one way or another- and if you see yourself as something less than this in any situation, you fear loss, for you have been told that to be less is to lose. “If you think you are right about everything, who needs to talk with God? With all this inspiration finding me at once, you can understand why I’m having trouble sleeping. All my neurones are firing at once…firing more bullets than Yosemite Sam who I mentioned in my last post. I also found music. 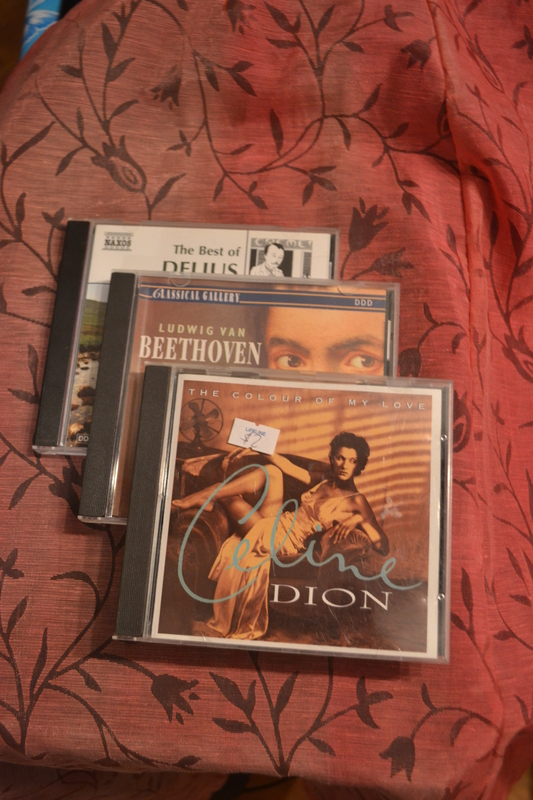 Managed to buy three CDs at $2.00 each. There was Celine Dion: the Colour of My Love. In keeping with my connection with Beethoven and subsequent explorations, I bought Piano Concerto No. 5, Emperor and the `Walstein’ Sonata. I’m sure I’ve heard my grandmother play these pieces and they’re all very familiar and comforting. As a child, I used to fall asleep to her playing curled up on my father’s lap. My father also remembers falling asleep to similar tones when he was a boy. I also picked up “The Best of Delius” which I actually mistook for Sibelius. One of the pieces on the CD, Koanga Act II: Closing Scene was actually arranged by British conductor Sir Thomas Beecham. Coincidently, my grandmother Eunice Gardiner had returned from her studies at the Royal Academy of Music in London in 1940 for the ABC Tour of Australia with Sir Thomas Beecham. Personally, I didn’t actually know I wasn’t listening to Sibelius but I do love the music. Again, find it dare I say “inspirational”! Once, and just so small as I? Out of Heaven, and just like me? And ask where all the angels were? Not an angel there to dress me! Like us little girls and boys? Play Can you see me? through their wings? Thy robes, with playing on OUR soil? In Heaven, because ’twas quite clean blue! And didst Thou join Thy hands, this way? And make the prayer seem very long? Should join our hands to pray to Thee? The prayer not said unless we do. Kiss Thee, and fold the clothes in right? Kissed, and sweet, and thy prayers said? And listen to my baby-talk. Has not changed since Thou wast young! Ode for Music on St. Cecilia’s Day. And to her Maker’s praise confin’d the sound. And Angels lean from heav’n to hear. Hers lift the soul to heav’n. Perhaps, you won’t be surprised to know that I’m going to head back for one last peak before I head home. While all those minimalistic declutterers are all madly dumping all their Christmas gifts. This is better than the post-Christmas sales! After finding all this inspiration, I can’t but wonder about these people who take their Christmas presents seemingly straight from the under the Christmas tree and dump them straight at the op shop. I found a beautiful framed picture of rainbow butterflies which was still sealed in its plastic wrapper. It hasn’t even been opened let alone hung up. Now, I don’t know how you feel about butterflies but for me butterflies have some kind of resonating meaning and symbolism. They’re special and inspiring and I could just watch them flitter fluttering around my garden for hours. So it beats me how anyone could you ever throw a handmade butterfly picture out…especially when it has rainbow butterflies? Rainbows mean hope. Hope and butterflies combined…that’s a very powerful message to chuck out. I can’t help but think of whoever bought that gift and what messages they were trying to impart. This present wasn’t just a pair of common socks. It was the sort of present which takes a lot of thought, is carefully considered and yet it fell on concrete ground unable to soak up the rain. What an absolute shame! However, as they say, one person’s loss is another person’s gain! Speaking of gains, we’re moving back home early next week and I just can’t resist one more peek. It’s only been a couple of days but you never know who’s had a big clean-up and decided they don’t want their treasures anymore or have moved on to new horizons. After all, inspiration is made of stepping stones. That’s the point. The real aim is to grow and to seek new horizons and as you grow, you naturally have to leave some things behind and as they say “spread the love”. Wish me luck or you could even say a prayer…seek and you will find. I always do! Perhaps, the real miracle would be Rowena arriving home from an op shop empty handed. PS I am almost too ashamed to admit this but while I’m immersed in paradise with this wondrous view suspended just beyond my nose, I’ve been so lost in my writing and tap tap tapping away on the laptop that I’ve been oblivious. The view is out of view. Will remedy that when I get back. Immerse myself in it. Multitasking has never been my thing! Child in Bush by Robert Dickerson 1959. 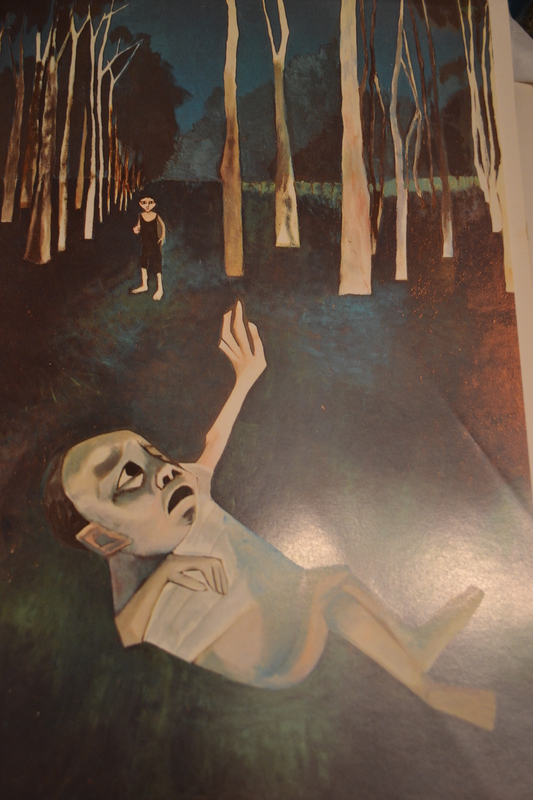 PPS: Found a sensational art book in there today: Masterpieces of Australian Art by James Gleeson published in 1969 with beautiful colour plates. It opens up with a single Aboriginal painting: A Gnormo or spirit called Yungwalia and closes with Stanislaus Ostaja-Kotkowski. What a find! Neale Donald Walsche, Conversations with God: An Uncommon Dialogue, Hodder & Stoughton, 1997, acknowledgements page. This entry was posted in Chemotherapy, Christianity, Poetry, Uncategorized and tagged 1960s, antiques, art, Australia, Avalon, Beethoven, Bible, books, Christianity, Delius, family, fashion, God, healing, inspiration, Jesus, John Denver, markets, miracles, music, op shops, parenting, philosophy, shopping, spirituality, Sydney, vintage on January 24, 2014 by Rowena. Yes! The treatment is working and the good news is that my blood test results are right down in the remission zone…the best result I could have asked for. I’m absolutely stoked! I am really feeling exhausted now. Very, very tired but I really wanted to share my good news with absolutely everyone who is traveling along this journey with me, beside me or especially going down the same or similar roads themselves. We are not alone and we all have to believe in miracles. Have faith. After the success of skiing down the mountain in Perisher last year only to run straight into pneumonia and a life threatening flare up of my auto-immune disease, I really doubted that I still had the strength or capacity to turn my mountain around again. 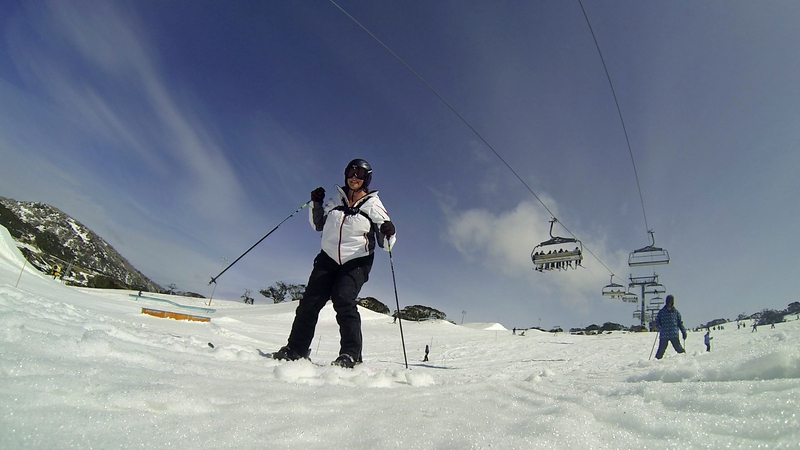 Skiing down the mountain at Perisher in August 2013. Well, to be perfectly honest, I didn’t. It took a team of highly specialised doctors, toxic drugs, fabulous nurses, support from family and friends, a highly entertaining and philosophical driver to and from my treatments provided by Carer’s Respite. A wonderful husband who is married to a mad writer with a chronic illness (I’m not sure which is worse but unfortunately being married to a writer or any other form of “creative” doesn’t entitle you to a Carer Payment or any other kind of practical support. My chronic illness does.) My parents and brother, particularly my Mum, have looked after the kids as well which has given me the capacity to rest and heal. They also let me stay in their soon to be home at Palm Beach in a most stunningly inspirational location. I’m sure this has really boosted the healing process. I’ve also been swimming in the pool to improve my lung capacity. This result has taken a lot. Above all else, I believe it took God. I firmly believe that he is with me. I still don’t understand why he didn’t stop me from getting this disease in the first place. Yes, I do actually. The way I see it, everyone has their lot…their challenge. I don’t know whether this is designed to stretch us and help us to grow but that’s certainly been the end product of my experience. That said, I have also chosen growth over anger, stagnation and bitterness. Our lot isn’t easy either. It is very tough on our entire family, extended family and the ripples resonate out to friends and even strangers. When it flares up, it is pretty demanding and all-encompassing. My situation isn’t what I’ve call a healing. I’ve gone into remission and this more a case of management, rather than cure. This chemo was round one. I will now have 4 fortnightly sessions until my specialist gets approval for my next treatment a drug called cellcept. I haven’t looked this up yet so goodness know what that’s going to do to me but as I’ve said before, I’ll do anything for love and the list of nasty toxic drugs I’ve taken is adding up. Here is a quick photographic tour of my day. I had intended to take photos of me actually having chemo and lugged my huge SLR around the hospital. Took other photos and forgot the main one. Anyway, as it turned out, it wasn’t my last chemo treatment so further opportunity awaits. Writing in my journal while waiting to see my rheumatologist. What are the results going to be? 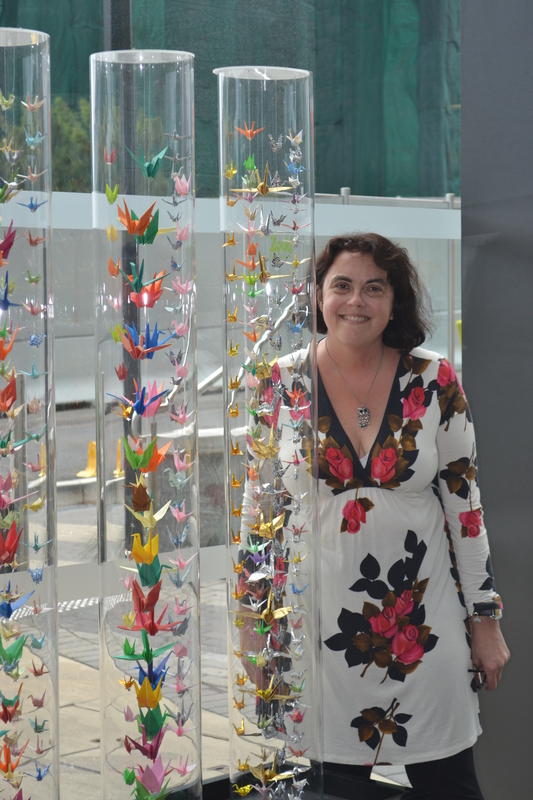 Celebrating Victory with the healing paper cranes at the hospital. I also wanted to share with you my immediate response when I found out my treatment had worked. When I was first diagnosed with this disease, I had called it “Dermie”. Dermatomyosistis was way too long and unpronounceable. Anyway, soon after my diagnosis I was sitting in the food court in the old hospital when I wrote what turned out to be a very cathartic story about it. In the story, I was being pursued by Dermie, a very possessive lover who was relentlessly stalking me. Anyway, the story ends with a comic twist when I introduce Dermie to the Internet dating site RSVP and he races off and meets someone else. I still remember how much I laughed when I wrote that twist. It felt so good and was so cathartic! I felt all this negative energy immediately pour out of my system. It was just fabulous! Anyway, today when I heard the good news, I pictured this little cartoon character with twin pistols both barrels pointed straight at Dermie . Bang! Bang! Not only did he shoot Dermie blowing him to smithereens, he was also jumping up and down on the spot laughing. He was actually happy! Thrilled! This character was totally warped! Now, as much as I wanted Dermie dead and out of my life for good, I’m not into violence and had no idea who this gun-slinging maniac actually was until asked my dearly beloved husband. Turns out it was Yosemite Sam who I can’t even remember with my conscious brain so I have no idea here he found his way inside my head. (Turns out he’s from Bugs Bunny. Obviously a deeply repressed childhood memory! More therapy sessions required). However, I’m sure I’ve already mentioned that I’m on a lot of drugs with these treatments and they are definitely doing strange things to my brain. This is absolute confirmation!! 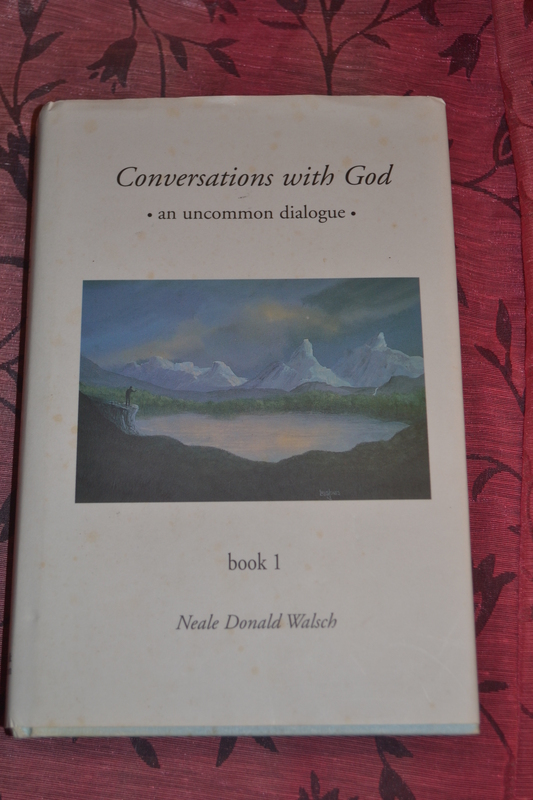 I actually packed a much more wholesome and even spiritually minded book in my bag when I left for the hospital this morning: Conversations with God: An Uncommon Diologue by Neale Donald Walshe. There were no gun slinging cartoon characters of any description! 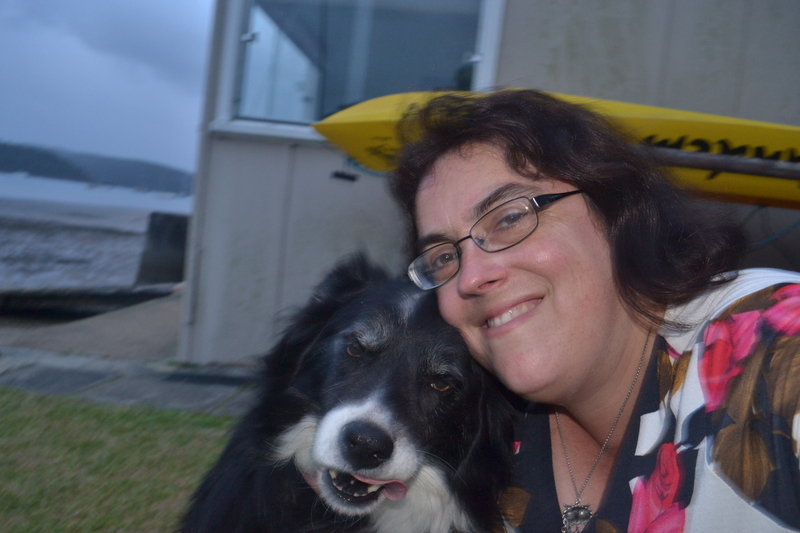 Back home with my beloved doggie…a selfie. Ended up writing down there debriefing myself…and him , of course! This entry was posted in Chemotherapy, Health, Uncategorized and tagged chemotherapy, Christian, God, healing, health, miracles, prednisone, survival, victory on January 23, 2014 by Rowena. Aside from not being ready to be picked up, I am ready for V Day. This means Verdict Day but as I said before, I am also aiming for V for Victory. Today, I find out whether the chemo has worked and that my disease has responded to treatment. I am being a very naughty girl going anywhere near my laptop this morning before I leave for the hospital. I am being picked up in 15 minutes and I am still in my PJs. I have discovered that you can’t eat and type at the same. I only have one set of hands. I just wanted to say that I feel prepared for whatever news comes my way today. I am amazingly calm and have been experiencing God’s peace which surpasses all understanding. For anyone who has known me for any length of time, you will know how much of a change…a true miracle…this really is. Just read my earlier posts about when the bird flew into my house and when I drove to Morpeth for the first (and only) time. I am also prepared. After much thought about the bag and packing situation for today, I have actually decided to use the new handbag and it is brilliant. I do feel incredibly organised and together. I am prepared for taking good notes from my doctor and everything is immediately to hand…including the tissues. I’ll have a spare this time. 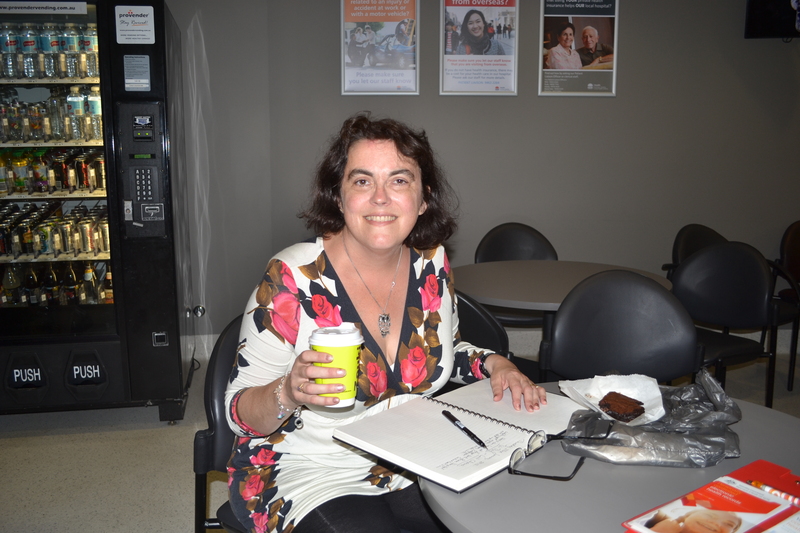 I am also taking my camera to get a photo of me having chemo and my journal. I need to record what happens today. It might ust be a life changer. I don’t know but I am prepared. It really means a lot for me to share my chemo journey with you and indeed so much of myself. I do so very much with the hope that I might rewach somebody else out there who is struggling out there and needs a mate. Let’s hope that we all have a great day and I’d really appreciate your thoughts and prayers!! This entry was posted in Chemotherapy, Uncategorized on January 23, 2014 by Rowena. There is silence and almost perfect stillness outside. The cicadas are quiet…absolutely quiet, which is rather odd. Depending on how you feel about the sound of cicardas, there has either been this constant deafening siren blaring throughout my time at Palm Beach or the rhythmic chant of an Australian summer. I have always loved the cicadas and always have to pick them up and feel them walk up my clothes with their sharp claws. I get an absolute thrill even now at the more mature age of 44 when I manage to spot one and pick it up and hear a loud protesting buzz. While I’ve been here, I have also been something of a cicada rescue service. Only this morning, I spotted one out on the balcony under the gaze of a feral Noisy Minor bird and moved it on. The silly thing was just sitting there completely paralysed as though you couldn’t see it. Hello! Unfortunately, the cicada on the window sill wasn’t quite so blessed. It’s been captured in a spider’s web and mummified in silk. There was heavy rain last night. The dog is soaked and the canvas outside has been painted a very dull grey. I don’t know whether the tide is going in or out. I should. I just don’t seem to have that knack of looking out there and instinctively knowing. No doubt I could probably work it out but when I check back soon, I’ll find out anyway. I feel like I am on very borrowed time today. It is the last day before my last chemo treatment. Tomorrow, I am also finally meeting up with my rheumatologist to not only find out what happens next but also get the verdict. Hopefully, it won’t just be a V for verdict but also V for Victory. Oh how I would love a V for victory! I have had so many serious scares with this disease and so far we’ve been able to fight them off and win. It really has been a very long bombing campaign with me scampering along the ground running for cover or like the people of England sheltering in the tube during the London Blitz, bunkering down and staying out of sight. To be perfectly honest, I haven’t really been thinking about getting my results all that much. I’ve been really focused on my writing as I have been mega inspired and trying to get all that written down has been a massive job. I am working on a diarised account of my chemo experience, which ironically is intended to be a funny book. When I first considered making it funny, I was rather sceptical. “As if!” Here was this hellish experience of having all-consuming nausea and throwing your guts up not to mention overwhelming gripping fatigue. I just expected to spend summer in between lying in bed upstairs with the air-conditioner on and rushing to throw up in the loo. Obviously, not very attractive postcards from Palm Beach but it was only six weeks and such a short blip in my life that it was nothing…as long as the chemo worked. At times, I have almost forgotten or put aside the fact that I am having the chemo for a purpose. The purpose isn’t to survive chemo and to get through the treatment, although in this instance you would definitely say that is secondary goal. Chemo is toxic, nasty and in itself can knock you off. The real goal is to gain control of the dermatomyositis as my lung specialist would say and get me into remission again. However, this is the incredibly scary part because that is only something we can influence. We can’t control it. That has been proven time and time again when this wretched disease flares up yet again and reasserts its dominance. Reminds me perhaps that while it might not be the boss, it has aspirations! Yet, I’m a fighter. I’m the quintessential Aussie battler. When I said that I would do anything for love and I would fight this disease with absolutely everything I’ve got and more, wretched Dermie didn’t know who he was up against. He has to deal with Roweeee. That’s Roweeee with four eeee’s swinging from the chandelier like Tarzan. I am going to win…at least I jolly well hope so! The trouble with fighting this auto-immune disease is that I am actually fighting myself. An auto-immune disease develops when your body attacks itself so it is actually you fighting yourself. Now, the trouble is that when you are fighting yourself, you are evenly matched. I’m no expert in military strategies but it seems like I am never going to win in any kind of hand-to-hand combat. We are evenly matched. My only hope is some kind of very unconventional, surprise guerrilla attack. Or perhaps by blending in really well with my surrounds and just quietly disappearing. You know those games of hide and seek where the child hides so well that everyone else has given up trying to find them and they’ve moved onto something else and Mum is just about to call the Police when they finally poke their little head out again. However, most of these manoeuvres are out of my hands. My rheumatologist is the Commander-in-Chief assisted by the lung specialist. I am sure they are not acting in isolation either and have consulted other world experts in dermatomyositis. Given how rare this thing is, that’s hardly a huge effort. There is a Myositis Clinic at John Hopkins in the States and you would expect doctors to confer and gather data on this rare disease. We all need to do whatever we can to make it easier for those who are following in our wavering footsteps. I am finding it particularly helpful to write about my chemo experience. I am not just doing this for myself and to fulfil my long held goal and need to get a jolly book actually published but I’m doing this to help others and to be their chemo friend. You really do need someone to chat away and talk to or at least I do and you’re not always well enough for visitors and to actually talk. It’s more a case of chatting away in your head which means you’re not going through this thing alone. You have a friend. I don’t even really know who I am talking to as I write. When I was in high school, I had a diary and it was addressed to Dear Anne as in Anne Frank who wrote her experiences of being a Jewish teenager in hiding to “Dear Kitty”. Of course, this mystical diary person understands absolutely everything you are going through without query or judgement. I can see them sitting there on the edge of the couch with a cup and saucer in hand intently listening to each and every word I say. Of course, this journal world is so different to the real world. For starters, I am alone down here at Palm Beach. I have no one to talk to. Correction…I have the dog. While I must say that he makes almost the perfect companion and is one of the best listeners I’ve ever come across, there are certain distinct differences that I really can’t overlook. The dog is a dog and even if I do connect with him emotionally and know that he gets me, he can’t be my perfect companion. He’s not allowed in the house and he’s not allowed at the beach either. He is actually rather restricted. Instead, I find myself chatting in my head and writing in my journal and my blog. My brain is rather hyperactive constantly beavering away. I am so very inspired and no doubt a bit manic from all the prednisone. It might be destroying my bones but it’s powering up my mind! Tomorrow is V-Day. V for verdict and hopefully V for victory. After exploring Beethoven and having my healing Reiki experience and photographing waves at Whale Beach, I really need to focus and psych myself up for tomorrow. What will it all mean? CK reading is back under 200. The treatment has worked! My CK reading has come down somewhat but isn’t in remission and the treatment has been partially successful. I guess here we’d be looking at a reading in the range of 300-600. It hasn’t worked and my CK reading is over 600. Of course, I would love the treatment to work! I would love to be in remission! I would love to send Dermie running to the hills lugging his heavy cases and watching his clothes tumbling out along the beach behind him. I would dearly love Dermie to get well and truly lost never to return. Oh please no one give him a compass! I don’t want him back!! No! No! No! No! No! But we’re not living in a perfect world. Although I have made a conscious decision not to look up the stats on this treatment, I know that it is not 100% guaranteed. I know not everyone responds. There is a gap and it is a significant gap and I also know that I have a fairly aggressive and very persistent form of the disease. As I said, I am fighting myself and I’m one hell of a fighter! I don’t know what I’m going to do if it hasn’t worked. Oh yes I do. I’m going to cry! I’m going to cry and cry and cry and cry until my tears fill up the bay. Then I’ll fight back. Keep going. Persevere. We’re going to get this disease even if it gets me first. By the way, the tide is coming in. I didn’t need special tide reading skills after all. I just had to wait. I just rang Geoff to see whether he thought I should ring my GP for my results. In a way it made good logical sense to get the results today to see whether Geoff should take time off to go to my appointment with Professor tomorrow. Plan ahead. I also probably preferred the idea of getting bad news in the privacy of home when I could become a blubbering mess without having to try to keep it together. I know hospitals are places of sickness and dying and that it is perfectly acceptable to fall apart there but even in the midst of utter sadness and heartache, I’ve still wanted to keep it together. I have dreadful memories of clutching my one and only tissue while praying in the hospital chapel. Naturally, that one and only tissue couldn’t handle the job. It was like the little boy with his finger in the dyke…totally overwhelmed. I remember trying to fix myself up enough to bolt into the hospital toilets and then went into the Pink Ladies and bought a packet of tissues. It was funny because the lady said something about hayfever being bad this time of year and I don’t know whether she was just helping me save face or whether I’d fooled her completely. How stupid of me! There I was a mother of two young children staring death in the face and I’m trying to keep up appearances. Trying to stop the jolly dam from flooding when I really just needed to cry and that was fine. Even in that darkest of dark hours, I was trying to be strong. Stand tall. Stitch myself back together and not fall apart. In a sense, these are good qualities especially for a fighter. You have to dust yourself off and get back into battle again. You can’t afford to lie face down in the mud or the enemy will get you for sure!! That said, it is quite permissible and indeed perhaps required that you have a break so your wounds can heal. You rest and renew your strength so that you are better equipped to fight. No point dragging yourself into battle. You’ll never be able to swing your sword. So far I have only mentioned my doctors in terms my combat team but it is a multi-disciplinary team assault. I am seriously praying that God will heal me using whatever means. He is really the ultimate Commander-in-Chief. He is the one who decides whether I live or die although I do actually believe that he has given me quite a lot of say. I didn’t have to go and get that first CT scan of my lungs two years ago. I didn’t really have symptoms of Institial Lung Disease (ILD) at the time. I had read an article recommended by the Myositis Association of America which said that ILD was more common in myositis patients than previously believed. I have the JO1 antibody which means that I am more at risk of developing ILD so I was already forewarned. I also knew that with any problem, you are best hitting it early to get the best possible outcome. That’s the old stitch in time saves nine approach. Those CT scans were devastating because my very worst fears were confirmed. I had ILD. However, the good news was that it wasn’t active and it was minor. I was safe…at least for now. The other good news was that we were well prepared if and when it went nasty. I now had a lung specialist who knew me and the disease and he also worked with my rheumatologist. I had a team. So when the CT scans showed that the ILD had progressed and had become “established”, I already had a team in place. They met. Worked out the best approach and bang it happened straight away inspite of Christmas and the fact that nothing even happens in Australia in January. We were onto it. At the same time I’ve been having chemo and zapping my body, I have also been exercising. I’ve been swimming 20 laps of the pool around 4 days a week. I really don’t like getting wet and I do enjoy it once I’m in but this isn’t something I like. It is something that’s a conscious grudge effort. I do it because I am trying to get the very best out of whatever good parts are left in my lungs. I am focusing on the cells which work, not on the cells which don’t. I really don’t know enough about how lung cells work and I know there’s scarring and they talk about the fibrosis being permanent. Yet, at the same time, I think about trumpet players and swimmers and I’m not sure whether they actually have scientifically proven bigger lungs but that’s the impression I have. You hear about all those Olympic swimmers who started out swimming to improve their asthma and it works. Geoff’s uncle Claude was told he was going to die from lung disease. He was a smoker and he quit immediately and survived that crisis. When I think about the statistics, I am trying to think of what I can do to get myself down the winning end of the equation. Somebody is going to die very quickly from this disease and someone else is going to respond brilliantly to treatment and go into a 100% perfect remission and never hear from this wretched disease ever again. How do I give myself the very best chance of being the winner and having my V for victory? What can I do? Me as a small, seemingly insignificant untrained individual…what can I do? Probably the very most important thing I can do is own my disease and take responsibility for it. I routinely monitor my CK levels so I know where I stand. I don’t just walk away and leave my disease to manage itself. I don’t turn my back and say “I don’t want to know”. I am checking. The frequency of these checks changes depending on the results. I’ve had quarterly blood tests and I’ve had them weekly but I’ve had them. They keep me informed and keep my medical team in some kind of “control”. If you have read my blog, there a story on there about kayaking and how maintaining your goal takes constant monitoring and correction. That you just can’t let the kayak drift or you’ll have to expend alot of energy to get back on course. That’s what it is like with this disease. Taking responsibility also means that I know my own blood test results and I file my reports. I have a bit of a mental picture of how things have gone over time and what has been the most likely trigger for my flares. So far it appears that the prednisone can’t go below 10mg and flus and cold don’t help either. Doing whatever it takes to maintain a positive mental attitude. You really need to be in peak mental shape to fight a chronic, long term life-threatening disease especially when you have a husband and little kids and a Mum, Dad, brother, Aunties, Uncles, sister-in-laws, nephews, nieces, cousins, friends. Since I’ve been having the chemo, I’ve pictured like a set of scales. Bad stuff on one side and good stuff on the other. The more bad stuff which piles up, the more good stuff you need to do to counter balance it. So when it came to me and the chemo, I asked my Dad if I could stay at the beach house throughout to give myself the very best chance of getting through it emotionally and spiritually. I’m a big fan of distraction and with chemo you’re not allowed out in the sun and I figured I’d be pretty crook but I thought I could sit inside and watch the pelican glide back and forth hunting for fish. Watch the ducks. They’re always a bit of fun. There was also the pure smooth serenity of the water not quite sitting still but gently flowing somewhere and the variations between high and low tides. Being here gave me a huge, massive psychological edge versus being at home which has borne the brunt of 8 years of chronic illness, medical appointments and just plain discouragement. As much as I could have used this time to get the house sorted out. Decluttered and had the kids will organised for school, I needed to get as far away from all of that for my own well being as I could. I didn’t need to be immersed in problems. Crap and all the thing which needed to done while I’m trying to heal my body and mind. I needed to be kind to myself. Unfortunately, the rest of the team hasn’t had that luxury. Geoff had last week off work and spent the week down here. He returned home Monday night to find that the fish tank had leaked on the carpet. He is still battling with the car which has had endless troubles over the last couple of months and stupid problems at that. The Christmas tree is still up with no sign of coming down and then there’s work. Meanwhile, my parents have the kids. My Mum’s not well. My brother’s not well. Dad is starting to notice rheumatoid arthritis moving into one of his fingers and it is rapidly starting to twist. Dad is running his own business while helping to watch the kids. Yesterday, Mum had some pre-schedule dentist appointment so Dad had the kids and he took Miss off to the dentist because one of her baby teeth had fallen out some time ago and there was no sign of the adult tooth. I found it hard to believe that in the midst of my chemo treatment that we’d find out that Amelia was missing a tooth but that is a bit of a family thing. Fortunately, that was fine. It is just taking its time and Amelia was proudly showing off the dental floss she’d been given. I have to admit that I don’t think the rest of the team was thrilled when I mentioned that I’d had a healing massage and had been watching the waves. Talk about luxury self indulgence! This just goes to show that there is quite a difference between what the person experiencing the problem goes through and the experiences of the support crew. It is like the duck. I am gliding almost effortlessly along the surface while the rest of the family are my feet madly paddling trying to keep me afloat. They are literally busting a gut so I can rest, relax, recuperate and take it easy. Now, I haven’t exactly been doing nothing and I am actually hoping that my writing will translate into some kind of income that can also keep our family afloat. As much as all this writing is cathartic, stimulating and fun, I do also view it as my job. The best chance I have of trying to earn a living. That’s right…a living not a dying!! I am also making a mental note to self that the support crew needs a break and that we need to bring in the support crew for the support crew once we get home. This list should be set up as more of a mind map than a numbered list. All of these factors are important. Talking about the support crew, reminds me of the importance of the support crew. I would be dead on my own. No doubt about it!! I have had a GP who has seen me through this process and it really has been a difficult process for her. Rare diseases aren’t easy and everybody prefers to be in their comfort zones. Know what it is. Know what they’re doing. Rare disease aren’t like that. There is little precedent. It’s mostly unknown. She bends over backwards to help me and we often have a laugh despite my circumstances. She wants to be played by Kate Blanchett when my book finally becomes a movie. There is my wonderful specialist who has always taken an interest in my disease. He brought his students round to see me and he is fighting tooth and nail to give my kids their Mum. I only know both my specialists in a very small realm but I know they are good person and they would do whatever they can to save my life. We might and no doubt one day will ultimately lose the battle but they have given their all and then some. In addition to these medical people and my family which I’ve mentioned, I’ve had countless people pray for me and I’ve talked the ears off a few hospital chaplains and one of my dear Pastor who isn’t well himself right now. I have wonderful friends who have picked up the kids, cooked meals and listened. I have been incredibly blessed but at the same time, I still try to give. I don’t have a monopoly on adversary and back luck. Everybody has their cross to bear. Distraction, otherwise known as “keeping busy” is also a wonderful thing. During this chemo experience, I have had various little projects. There has been my “teach the kids how to cook” project which has also turned into a real cooking expedition for me as I’ve extended my cooking beyond my usual chicken schnitzel and roast lamb. I’ve really been enjoying my weekly serve of Atlantic Salmon. It has also been an eye-opener to see the kids struggling with the grater and the peeler and realise that cooking is also building up their fine motor skills and confidence. Searching for recipes etc and putting my energy into this project certainly helped distract me from my treatment and whether I was going to live or die. It gave me a sense of purpose. I should have mentioned this sooner that the cooking project also brought the kids and I closer together and it was fabulous to not only spend time together but have this as a joint project. They both seem to enjoy cooking and largely embraced it. While I have ignored my violin a bit while I’ve been here, I have actually kept up my piano practice and Fur Elise is progressing well. It has been very positive to put my energy into my practice and slowly but steadily notice significant improvement. Only two weeks ago, I was bumbling through the start of Moonlight Sonata and couldn’t play C major scale with hands together. My hands weren’t in synch and it took a couple of goes to get it right. That’s pretty humbling when you learned the piano for over ten years and while I know I haven’t practiced and virtually haven’t touched a piano in ten years and have maybe even avoided the piano entirely…shunned it…I never expected that I couldn’t play at all. That rusty would become rusted. It’s been very therapeutic to tackle Fur Elise and through doing this daily practice, actually feeling that I can play the piano. Mum has now actually suggested that I learn to play Chopin’s Revolutionary Attitude. I had to have a bit of a laugh at this because suddenly I’ve gone from struggling to play C Major Scale which is very definitely in the “elementary my dear Watson” category to being told I can take on a concert piece. It sounded crazy to me but there has been a precedent. Mum reminded me that as much as I don’t like to think of myself as a chip off the old block ie my Dad that Moonlight Sonata and Fur Elise are also his pieces. Not long after Mum and Dad were married, Dad apparently decided to teach himself how to play Chopin’s Revolutionary Attitude while his mother was away overseas and there was a big dinner and recital in their flat on her return. If Dad can do it, I can do it!! Another adventure begins. I hope Beethoven doesn’t mind. We have been what you’d call “exclusive” for quite some time. You could also rebadge these distractions and call them goals…a sense of purpose…something to live for. Naturally, I have my kids and family, friends to live for but I also need something beyond that. Something that extends my skills and challenges me. Not that the kids aren’t challenging but even as a mother who is potentially dying and leaving her kids, I still need my own world…my own life and to extend and maintain my self and my own space and identity just like most other women. I just can not live and breathe for my kids especially as I may not die young at all and I still need to plan ahead and have a life…not just a death! I’ve had various goals which have sustained me. Most notably, there was my goal to ski down Perisher’s front Valley which I pulled off last year. I did my preliminary violin exam and achieved my A. I’ve worked part-time and done the publicity for the school. I have also poured myself into the children and tried to help them reach their potential often in opposition to themselves. Goals are vitally important for maintaining that sense of purpose which helps get you over life’s speed humps and even steep mountains and doesn’t let you get bogged down in the mud. Humour is an essential survival strategy. It is quite a common approach for someone going through severe adversity to turn it into a joke and laugh about their predicament…just like my chemo for Christmas. “All I want for Christmas is my chemo” I pictured a little girl singing all I want for Christmas is my two front teeth with her cute gappy smile and there I was not so small and cute wanting chemo. Somehow you need to control the bad thoughts. My psychologist introduced me to the wonderful word: “catastrophising”. This is where you turn your bad news into a catastrophy of world-ending proportions like pumping up a balloon with hot air…off it goes. You setback has become a disaster. You’ll going to die. We’re all going to die. The entire planet is doomed!!! Instead, you have to stop. Take a few deep breaths and consider things from a more realistic perspective. Is this situation really as hopeless as it seems? What, if anything, can I do to make things better? How likely is the worst case scenario? I am slowly getting better at this but it is a learned skill like anything else. A problem shared is a problem halved. Talking things over with a friend really helps and keeping a journal is a great way of doing this as well particularly if you want to keep things private. Sharing a problem may not mean talking either. It might involve practical help. You don’t have to go it alone. I just thought of this one but solving the problem is actually the best way out of any crisis. Now, my medical situation is more complicated but for others just getting on with it and not procrastinating is possible. I should point out that while I’ve been tranquilly staring out to sea on one side of the house, the neighbours across the road have decided that my day of tranquillity the very last day before I have my last chemo treatment is the day that they whip out the chainsaw and atone for years of garden neglect. This is the only day this summer that the cicadas have been quiet and now the chainsaws are going. You’d have to agree that’s a bit odd. I just wandered out there in my pyjamas to give them one of those “I’m a %$@# shift worker. Stop the noise” glance. I would dearly love to go up to them and not so subtly point out that I am currently undergoing chemo and could you please keep the noise down. Oh my goodness that chainsaw is loud. If you have ever complained about cicadas, think again. These things are absolute beasts. At the same time, that house across the road has been considerably overgrown. After I recovered from the pneumonia, I made a few jokes about what it was really like when Sleeping Beauty woke up. There had been an elderly couple there and the husband died after a long illness. It really did look like the place was returning to nature as the branches enfolded the house. Suppose it will be good for the street to get the place sorted but why did it have to do it today? Right now when I desperately need a nap. I didn’t sleep too well last night and I’m sagging badly falling head first into my laptop. This sort of noise is one of the downsides of community…the cost. I haven’t exactly finished this post as such but wanted to get it up today before I get my results and also before I have my last hit of chemo. It still needs work but I wanted to get it up. This entry was posted in Health, Writing and tagged auto-immune disease, cancer, chemotherapy, Christian, chronic illness, dermatomyositis, healing, health, illness, inspiration, mom, Muscular Dystrophy, survival on January 23, 2014 by Rowena. Although I bought myself the perfect handbag, I won’t be taking it to hospital for my last session of chemo tomorrow. I know I said that it was the perfect handbag but it was actually the perfect medium-sized handbag. Tomorrow, I’ll be taking my backpack because I’ll be needing to take the kitchen sink along with me. I have an appointment with professor and then chemo so I could be at the hospital for most of the day regretting by now, of course, that I haven’t worked out how to use that notepad mini. I need books to read, writing paper and I’m also lugging my huge camera along to get a photo of chemo in action. Actually, if I was going to be sensible, I’d take my new shopping cart to the hospital. The ladies at the Red Cross shop at Avalon gave it to me yesterday to get all my books to the car. Parking was dreadful and for the first time ever, I actually asked them for a hand. That was when they presented me with the grannie cart…an easy solution. To be fair, I shouldn’t really call it a grannie cart because it actually looks rather trendy being dark navy with white leaves and in a style that you could describe as “subdued Hawaiian”. Moreover, is better for your back than lugging shopping bags around and it’s also good for the environment. I could easily walk to the shops and get the groceries home and save on petrol. While that all sounds fabulously wonderful, there’s still resistance. I wouldn’t want to be “seen” pulling along a grannie cart even though most of my friends are very environmentally aware and also understand the limitations of my physical health. I have my pride and I’m not quite 80 yet. Perhaps, it’s just me. I’m the one with the problem. I’m too selfish and too image conscious to do my bit to save the planet. Hmm, maybe…I might be able to give the grannie cart a go. That is, after I find myself a pair of large sunglasses so I can see without being seen! This entry was posted in Health, Humour and tagged chronic illness, diability, environment, fashion, handbag, health, shopping on January 23, 2014 by Rowena. While I was at the op shop today, I spotted a handbag. That’s hardly unusual but lately I’ve become a handbag-avoider so I was trying to stay away. Somehow, I’ve ended up collecting handbags and I don’t need any more. That is unless I can find that elusive, perfect black bag. This is a need… definitely not just a want! As much as I’ve been out on the prowl for the perfect handbag, I’ve ended up with way too many duds. Of course, they all seemed perfect at the time and full of promise but have been plagued by subsequent performance issues. At the very least, all my bags must be able to manage a book. That shouldn’t be mission impossible and yet it is. For some reason, big bags seem to have weak handles. Some haven’t even survived one train trip to Sydney, arriving back home in pieces. While I wasn’t looking for another bag, this bag caught my eye, probably because it was real leather. I might love leather but I’m still very fussy. No more small talk. These days, a handbag has to be “the one”! So there I was in the Lifeline shop in Avalon making the acquaintance of yet another bag. Just like my asbergers hero from The Rosie Project who developed a 16 page questionnaire to find a wife but usually managed to reduce it down to one question, I cut straight to the chase. Although this bag was rather determined to make my acquaintance, I was playing hard to get. I went straight to the list. Not that I actually carry around a 16 page check list of all the little extras I am looking for in this ultimate handbag when I do my rounds of the op shops. It’s more imprinted at the back of my brain which explains why I’ve ended up with so many duds. The print must be fading! Besides, I’m not actually looking to buy any more handbags. This is where my conscience kicks in. Did you hear that Ro? No more bags! You have plenty of bags. You have bags in every conceivable size, shape and colour. Indeed, you seriously need to downsize. Return to sender. You know you need to take them back to the op shop and you definitely don’t need more! More! Did I hear you say more?!!! Of course, all of this advanced psychology and declutter therapy has been totally wasted on me. Although this handbag isn’t exactly waving at me, calling out or giving me mad enthusiastic hugs, it is quietly persistent. At this point, I need your assistance. Can you tell me whether a handbag actually meant to be male or female? While this question might seem totally weird, weird scenarios are all part of being a writer. You see, if I’m talking about a handbag flirting with me and trying to attract my attention, is it going to flash a bit of leg or is it going to strut its stuff? It makes a difference. I’ve got to get it right. Anyway, I’ve decided that the ideal handbag for me would have to be a bloke and I mean a real bloke. We’re talking ruggedly handsome and definitely with a splash of after shave. I know I’m skating on very thin ice talking about handbags as men and I’ve knows a few friends who have borrowed “a suit” for a function but never a handbag! I certainly intend no disrespect. Anyway, my handbag had none of these manly features. Indeed, it is a Fossil. This doesn’t mean that it’s geriatric or that it was excavated from the cretaceous period. That’s a brand name and a good brand name. That, of course, meant that my beloved handbag has a price tag of $25.00 which in op shop terms is top of the line…expensive! At $25.00 this not so common handbag had to do the big sell if it was going to have a snowflake’s chance in hell of coming home with me…especially because I’m trying desperately hard but not very successfully to save money. Moreover, as I said before, I already have enough handbags and if you haven’t worked it out already, my real weakness right now is books…inspirational books! Handbags are rather empty relatively speaking! I bought the bag. You know I bought the bag. Once again, I am absolutely convinced and in this case beyond any shadow of a doubt, that I have finally found that elusive and exclusive perfect handbag. Now, my ideals probably differ from yours…each to their own. That’s to be expected. However, this time I know I’ve finally found IT…the 100% perfect handbag and I didn’t pay full price for it either. Couldn’t find the same bag online but equivalents sell for $300.00! Well done! Just let me share a few of the features with you. The bag has a leather exterior with a strong 2cm wide leather strap which can go across my body so it’s not constantly falling off my shoulder. There is a zipper on the front with a pocket where I can stick my mobile phone. This small and seemingly insignificant detail is a must. I barely use my phone but it’s almost guaranteed to ring at the worst possible moment when it’s lost in the bottom of some bag and I’m fishing through all sorts of biodegrading junk trying to answer it in time. At this point I’m usually left “smiling” to some stranger who finds my complete and utter disorganisation highly amusing and I feel like shooting the person on the phone for disturbing my inner peace. Why they haven’t introduced legislation to make these external pockets mandatory in handbags? I’ll never know. It’s such a no-brainer although I must admit that I still buy handbags without them. I lift up the magnetic clip to take a look inside. Amazing! I can’t believe my eyes. This bag was made for me. Moreover, it was designed by someone with a real flair for organisation who wanted to help me out of my pits of chaotic despair. Oh how I love you handbag designer extraordinaire! You are beautiful…an absolute angel who’s been heaven sent. This bag has a spot for pens and I can fit my notebook inside so like zap I am ready when inspiration hits. After all, you don’t want that pearl of wisdom to just pop out of your head as quickly as it popped in. You need to trap it…fast!!! Wow! This bag is absolutely fantastic. 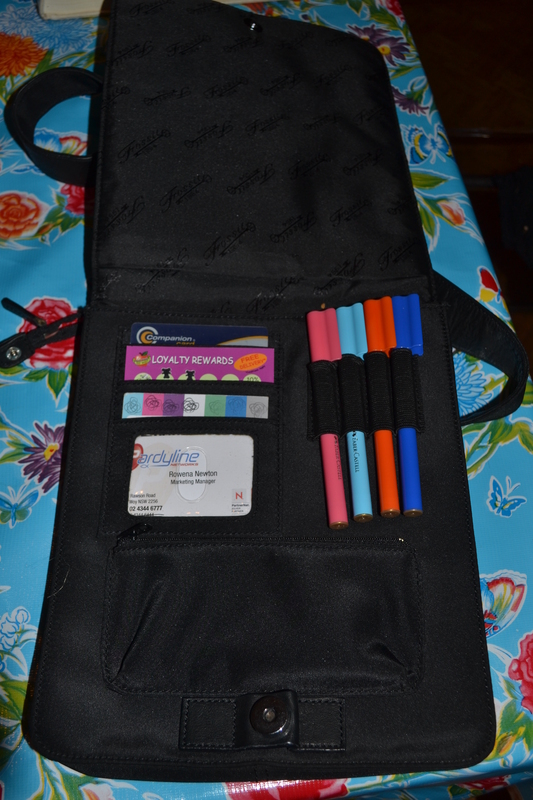 There’s even room for a novel and it also has slots for my business card, other cards and a zipper pocket for my keys. It will be absolutely perfect for business networking events as well. I am about to become supremely and absolutely organised. It is unbelievable and all for just $25.00. I guess there is always room for improvement! This entry was posted in Humour, Uncategorized and tagged bargains, charity shops, fashion, Fossil, funny, handbags, humour, op shops, organisation, saving money, shopping on January 23, 2014 by Rowena.